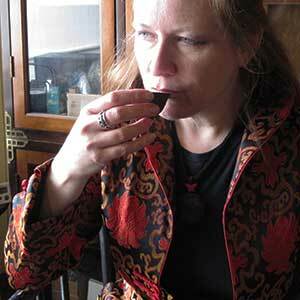 Virginia Wright is known more commonly as “Cinnabar” in the tea community, and she is also sometimes identified as “Gongfu Girl,” which is the name of the tea blog she has written since 2006. She owns Phoenix Tea, in Burien, Washington. Her experience in the tea industry includes serving as co-director of the Association of Tea Bloggers and writing as the Seattle Tea Examiner. Her writing about tea can be found in The Daily Tea's yearly print publication for 2015 and Katrina Avila Munichiello's book, "A Tea Reader: Living Life One Cup at a Time." She can be found on Twitter, Facebook, Google+, LinkedIn and welcomes contact by email. She is passionately committed to studying particular tea cultures and traditions throughout the world, and is inspired by the multiple levels of exploration that tea invites her to: art, science, culinary, cultural, etc.